← Gotta luv it …. Okay, I admit it – I am totally grossed out! Tacos de cabeza? Tacos of head? Oh for sure, I am gagging in the corner. I’ve seen two signs in two days – one for de rez and one for de birra .. We are talking cow and goat here. And while I’m sure the taco wrapping of maize or harina doesn’t really encompass a skull, all I can think of are bones and eye sockets … and I am more certain that my non-hoof-eating diet is the right one. 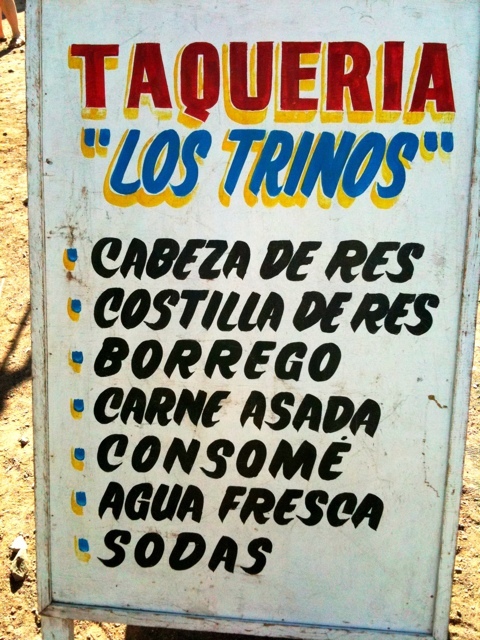 This entry was posted in Baja Living, Food, Loreto. Bookmark the permalink.